Before all the styrofoam got smashed, lost treasures were found, and various fatalities occurred, I saw my friend, former Rouper Brian DiSanto, at the New Year's Eve punk show at the Shop. Brian told me that he had worked on a new tape on which he did the vocals for Skeletonized, a former solo project of Triangle & Rhino's Matt Rappa that now included others on various instruments beyond drums and synths. That sounded pretty cool! I always enjoy Brian's weird lyrics and psychedelic subjects and Skeletonized's rhymic krautrock electro-rhythms. And so here is the review of The Lost Cosmonauts Were Just Wearing Camouflage. The cover art features one of Brian's collages. Even with the big shapes, there's always more to see. Stealth fighters and strange glowing humanoids interact with eldritch beings amidst a myriad of lights and video noise. My only real issue is that the text should have a small border of some kind to make it pop or perhaps be a little larger. The wild designs make this a messy cover, and it does a good job of showing what is inside. The first track on the first side of The Lost Cosmonauts Were Just Wearing Camouflage is a funky little jam called "Treasuring Electrocab". Brian's vocals remind me of stuff from one of my favorite Sonic Youth albums - NYC Ghosts and Flowers. It's a beat vocal trance to a fusion sound. "Quill, of Brilliant Hemisphere" has a big launch into pseudo-raga rock, a slow sway of heroic epic. I really like the little horns. It's a sunny dance track. The last track on side one goes back to the dark sounds with "Beaver Co. Static". This one has been fried by a TNT area under pine trees. The song slowly eases into UFO sonics with the vocals kind of drifting along like David Thomas' "man muttering in a crowd", as described by Greil Marcus. "We're stoned at the top of the road. Yeah, we're counting on". The end goes into a totally different groove, bass and static vox from a radio that is tuned to something else entirely but receiving this. Side two starts with the faster, post-punk "Herb & Opal". The vocals are mixed a little low on this one. The musick sounds really good; I really like the bell sounds that run concurrent to the bassline. The drums are kind of thin. "Scorched Pog Fiduciary" is a really cool name for a song. I first encountered the word "fiduciary" in a spam email and thought it was not a real word. It is. I like the contrast between the vocals and the rest of the track on this song. The drums play fast and light with various fills. Everything builds in intensity as the song moves along until the first big cymbal hit does it. "Calico Elevator" goes back to that UFO trip down the dark country road with more beat vox to go with that trip. This is the creepiest I have ever heard Brian DiSanto's usually cheery voice. The deflated horns and cavernous humming make this a very texturally unpleasant experience (in a good way). The last track, "Translucent Pygmies", jumps up after the downbeat darkness of the "Calico Elevator". It's quite a weird one. The song gets repetitious before everything breaks down in a Jonathan Richman way. That's the way to end it. I really enjoyed The Lost Cosmonauts Were Just Wearing Camouflage. It's quite the trip into other places, meeting other beings, and traveling by various vehicles, some of which may be venomous or inflatable. The only thing that was a little off for me was that the vocals sound a little different than the instruments in certain tracks. It works well when they are slower, beat lyrics but not so well on a more rockin' tune. It's nothing major though by any means. 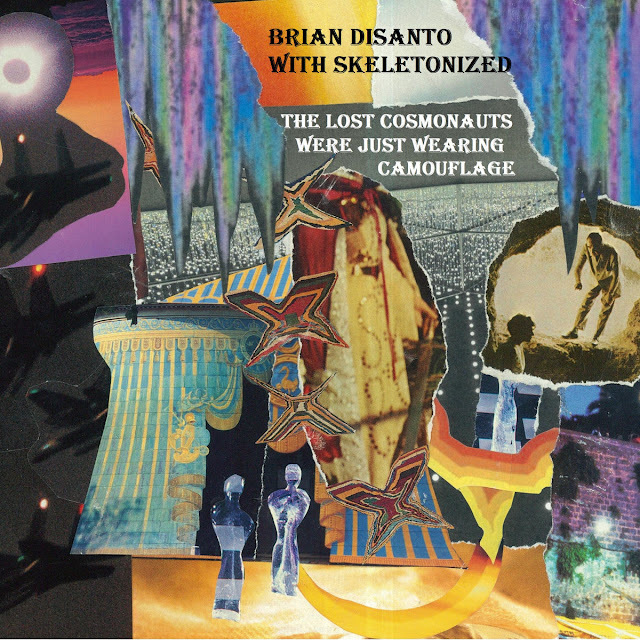 At the perfect length of time to travel the sonic waves, if you like sort of lo-fi, "outsider art", Brian DiSanto and Skeletonized have made an album worthy of checking out for sure. The Lost Cosmonauts Were Just Wearing Camouflage receives a Good.